The Lodge meets at 6.30pm on third Thursday in September, October, November, December, January, February, March and April. You can always be sure of a warm welcome to Corsham Lodge No. 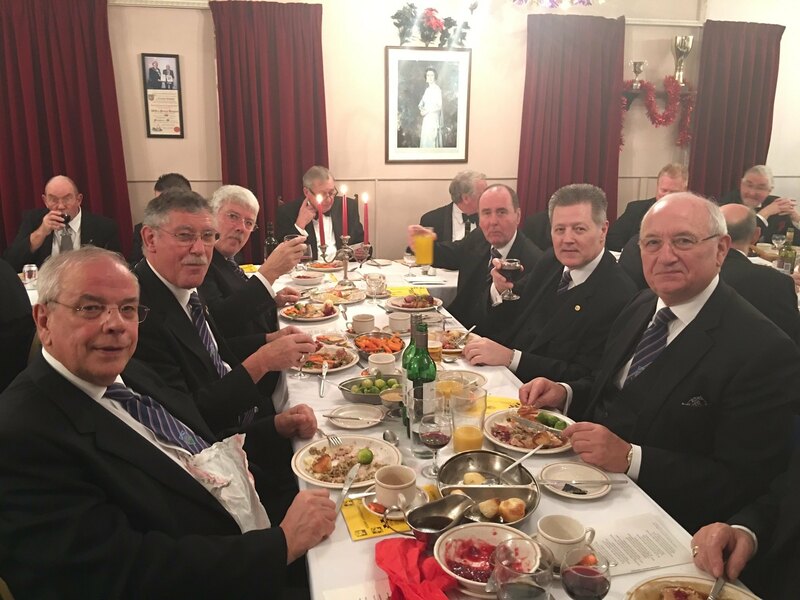 6616 but there is no doubt that the Christmas meeting brings out even more (if that's at all possible) of the genuine appreciation of a visiting Brother or Brethren. Chauffered by Ian Lever, father Ken with Bros Kevin Logan and Peter Winton left Swindon at 4.30pm thinking there was likely to be a lot of traffic on the road to Corsham it was better to leave plenty of time, needless to say there was no traffic and Ian, a Jenson Button fan, arrived at the Masonic Hall with plenty of time to spare. If they had anticipated their host to be on hand to greet them they were sadly disappointed and so had to buy their own drinks. Their host did eventually arrive, far too late to buy a second round! Next to experience the full majesty of the Acting Director of Ceremonies was Deputy Provincial Grand Master, Peter Winton - no stranger to the one liner and a worthy foil to the swift repartee of Bro Francis; again some witty banter was exchanged. Thankfully for Stephen Bridge APrGM, he was was informed by Bro Francis that he had no comments for him, thus sparing him the requirement to offer a response - although it has to be acknowledged that the Assistant Provincial Grand Master is no shrinking violet when it comes to the instant riposte, having admirably proved himself in his inaugural year. The Lodge formalities being over the Brethren proceeded to the business of the meeting which was the Initiation of Bro Andreas Kalogerou, a ceremony conducted in an outstanding manner by W Bro Foster Lewis and his team of officers. It is always difficult to pick out members of the team for further praise but on this occasion it is proper to record the superb work of the Junior Deacon, Bro da Silva; the excellent presentation of the Working Tools by Bro Deane and the Charge to the Initiate delivered by Bro Malins. The Lodge was then closed and the 'Swindon Masons' were escorted from the Lodge and to the dining room by their host for the evening Bro Francis Wakem. The supper table was as always a feast of good things all prepared by Andrew and Frances Evans and seved by their excellent staff. There is no doubt that the dining experience at Corsham is reason enough to travel to the West of the Province. During the evening carols were sung between courses, the newly Initiated Bro Kalogerou was serenaded and all this to the accompaniment of John Beach, organist extraordinaire. It was a fantastic night and all the guest were wonderfully hosted by the Lodge - in particular the Swindon contingent who wish to thank Bro Francis for his hospitality, companionship, laughter and also his Mother Lodge for their very warm and friendly welcome.